Kevin Benavides has been almost invisible since the start in Lima, but today he is taking the initiative. 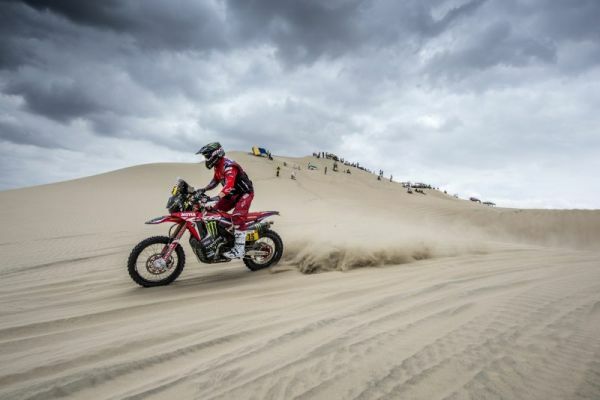 The factory HRC rider flew through the first dune section to post the fastest time after 100 km of racing, 22 seconds ahead of his consistent teammate Joan Barreda. Walter Nosiglia will not be finishing his third Dakar. The Bolivian, who already crashed out during the fourth stage last year, is being evacuated by the medical team after sustaining a double fracture of the right forearm 21 km into the special. 50 kilometres into the stage, and with the competitors entering the first dune section of the day, the race is closer than ever, with the top 11 riders within 1′45″. Ricky Brabec is setting the same infernal pace as yesterday. The Honda rider holds the lead 50 km into the stage, just nine seconds ahead of Joan Barreda, also a force to be reckoned with today. Matthias Walkner is trailing by 1′33″ after struggling with opening the road.